Here's some tips, tricks, and Reroll guide for newbies playing MAA 2. Learn how to do Hero Re-rolls, manage in-game features, redeem Daily Freebies, use Resources, and more in Marvel: Avengers Alliance 2. As you start the game, Hawkeye + 2 Random Heroes will be given as free heroes, but what if we want to change those 2 Free Random Heroes with what we actually like to play with? - To make things easier early game. It's true that you will eventually get better Heroes but for a free user, it will take a while and it would also depend on luck or "RNG". This is a nice method too if you are looking for Heroes that fits your play-style. - It is also true that you can use any starter Heroes and depend on synergies, but a free user with no decent Tank or at least a Healer will eventually hit a wall, sooner than a player who re-rolled. Yup, some hero teams are also harder to play. - If a Facebook account is already tied to your M:AA 2 game, detach that via M:AA 2's Settings Menu before clearing the M:AA 2 Data. This will delete your progress and start a clean one. - Ignore or close the "Connect to a Network" pop-up, always continue and login as a guest. DO NOT sync the game to your Facebook or other accounts yet. - Follow the Tutorial (use skip button to ignore conversations) until you receive and open your 1st Superior Power Cell, your first hero roll. Right before the next battle, you are now free to check the Store, go there and open your 2nd Superior Power Cell. The 3rd is always Stun Arrow, Hawkeye's ability. - Go to the Heroes section > select a Rolled Hero > Abilities tab. - "Protecting" skill is a sign of a nice Hero that can tank, get at least 1 Hero with this Ability. - If you did get one, especially Wasp, then it's ok to continue the game, just get your Healers from Ally Team Ups like Iron Fist, or if you are lucky to get one from your next Hero draws. Next, refer to the Last Step below. - BUT! If you want to go deeper and get your own Healer which I highly recommended, then continue to below steps. - Aside from a nice tank, a Healer is also a nice addition to your team. - Same as above check Hero Abilities to see if they can Heal allies. - If you are lucky enough to get 1 tank and 1 healer, continue and enjoy the game! Refer to the Last Step below next. - Note: This step is optional and only if it's ok with you to use your first few Gold early game, otherwise, skip this step. - If you didn't get any Tank with a Protecting Skill, or a Tank+Healer, then your next choice is to open another Superior Power Cell from the Store with your starting 25 Gold. Note that after the 3 attempts above, opening a Superior Power Cell will also give you a Hero Ability instead of a new Hero. - Example Heroes: Groot (tank and healer! ), Captain Marvel (support tank), and Captain America. - If you were able to draw a 3-Star Hero, save that game on a different Facebook account in-case you want to try and play with it. - Just fully exit M:AA 2 and clear it's Data. For Android users, go to Apps > Alliance 2 > Clear Data (no need to uninstall app). Re-download data then start from the top. - Go to the Settings Menu and sync that game first to your Facebook account. Login to Facebook using your device's web browser or Facebook App and go to your Facebook's "Account Settings" > "Apps" > navigate and look for the Marvel:Avengers Alliance 2 App > select "Remove App" to revoke game permission. This will allow you to load the game without the auto login feature later (you must do this!). - Clear M:AA 2's Data then continue and do your Re-rolls. - If you still can't draw what you are looking for and instead want to play with your previous saved account, then go to the Settings Menu and sync the game with your Facebook Account. A pop-up will appear asking if you want to overwrite or continue instead with the previous one. Choose "Sync Game" to load the previous one. - If you want to save your newly rolled Heroes again, then go to the Settings Menu and sync the game with your Facebook Account. A pop-up will appear asking if you want to overwrite or continue instead with the previous one. Choose "Cancel Sync" to overwrite. - Again, login to Facebook using your device's web browser or Facebook App and go to your Facebook's "Account Settings" > "Apps" > navigate and look for the M:AA 2 App > select "Remove App" to revoke game permission. This will allow you to load the game without the auto login feature later. Last Step: Save Your Progress! - Now that you have the Heroes you like, sync your game progress to one of you Facebook accounts (or other account). Continue and enjoy the game! 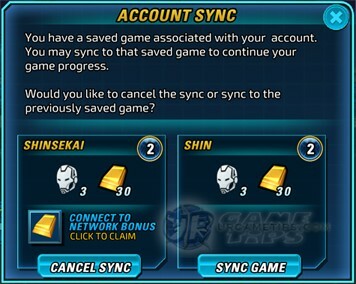 - Please Note: Be careful when syncing under same accounts, Choose "Cancel Sync" if you want to go with your current game and overwrite previous progress. How to Get the Protector or Healing Ability? - For 1-Star Abilities: Just collect and redeem Experimental Power Cells from the Store. - For 2-Star Abilities: Either buy them with Ability Points (probably), or collect and redeem Superior Power Cells from the Store (can also be bought with Gold) and hope to get one from them. - Daily Login Bonus: Login everyday to receive useful rewards. - Special Event: Login for 7 Days to receive a new Hero. - Daily Tasks: Complete to receive various rewards. - Daily PVP Rewards: Win 3 battles per day to spin the Daily PVP roulette. - Drops: Silver, Gold x5, Ability Points x50, Unstable Iso-8, Iso-8 Crystals up to 3*? - Drops: Silver, Gold x25, Ability Points x200, Unstable Iso-8, Iso-8 Crystals up to 5*. - Cooldown: Can be claimed once a day, resets at server time. - Survey Marker: Launch Scouting Missions (Commander Lvl 6). - Challenge Points: Launch PVP (Player vs AI) matches (Commander Lvl 7). - During early game, only claim Story or Chapter Task Rewards when you run out of Energy. Energy is fully refilled after reaching the next Commander Lvl. Why? because opening them early game will only give you low tier Unstable Iso-8 and Crystals. Better earn and open them once you reach higher levels to receive higher tier Unstable Iso-8 like "Canisters" (gives a nice boost for your Lvl 28+ Heroes), and Crystal Fragments or Shards from Crystallization Power Cells. Experimental Power Cells are ok to open early, but you can also earn them for Daily Tasks and to get 1-Star abilities for your new heroes. - If you need to use a certain ability a number of times to increase it's stars, better use the PVP Practice Mode to easily upgrade them. - Always remember: Tactician > Blaster > Bruiser > Scrapper > Infiltrator > Tactician. So if for example your Tank is a Bruiser, it is a good idea to get a Tactician to help eliminate Blasters fast. - Remember this Class advantages every time you create Strike Teams before taking on missions. 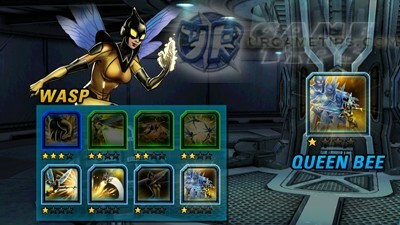 - Add Heroes and use them to receive more Team-Up bonus rewards (check inbox). Note: When preparing your Strike Team for battle, the Team-Up Hero you select cannot currently be on your Strike Team. - Every mission has a recommended Combat Level, follow and only enter missions with a Combat Level that you can. Level up, upgrade or enhance your heroes to be able to progress further. - During combat, tap and hold a Hero's secondary bar in the bottom right to learn how it works. - Try tapping and holding on any item or ability to get more information. - You can always swap your Team-Up Hero or any Hero with one of your Hero reserves during battle. - Hero or Ally Leader Bonus only unlocks at Hero Lvl 10. Leader Bonus from Ally Team-Ups will only activate if the Commander of that Hero is your friend. - Heroes that can help you with your Task Missions. - Unlocks at Commander Lvl 4. - Go to the HOME screen and open the Allies option. Here you can find your "Ally Code", let your friends enter it into their game to let your Team Leader become their Ally Team-Up Hero. Add in more friends by sharing your Ally Code. Is it OK to Use Superior Power Cells or Gold Early Game? - It is the easiest way to earn new Heroes, so YES, go for it and try to get at least 4 or 5 Heroes total, put the other 2 or 3 as your "Reserves" to let them start gaining some XP as you go. - You can get more Gold from Daily Task Missions reward, and also use it to replenish Energy. Some players do it once a day, or more once they are OK with the heroes they have. - Take your time and try to finish other Chapter 1 Story Tasks that you can. Finish other tasks once you reach higher difficulties with stronger Heroes. - For tasks that requires you to apply Hindered, Dazed, Exposed, Stun or Intimidated, this means that you need to find specific Heroes and Abilities that gives the debuff effect required. 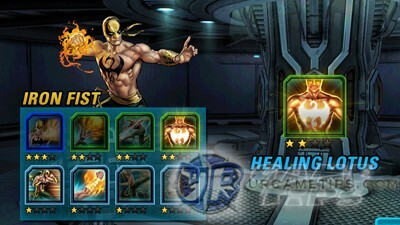 - You can do this by checking each of your heroes' abilities if you have, or use a Team-up Hero. To check the abilities of your available Team-Up Heroes for the mission, go to the "Heroes" section then Tap on the Hero you want to check, do not use Tap+Hold though or it will display a different window. - Also check your Hero's secondary ability bar. Example: Hawkeye's Sonic Arrow has a Dazed effect. - Dazed: Hawkeye's Sonic Arrow + Sure Shot or Multi-Arrow; or Hank Pym's Bioelectric Blast. - Intimidated: Spider-Woman's Fear Pheromones, Groot's I Am Groot, or Moon Knight's Fight or Flight. - Stun: Hawkeye's Stun Arrow; Spider-Woman's Seduction Pheromones; Luke Cage's Shut Yo Mouth, and more. - Shock or Unarmed Attacks on the other hand refers to the type of attack. You can check this by opening any Hero Abilities, then refer to it's "Tags" info. - While attempting to complete some Tasks, farm Research Materials on Chapter 1 Missions for your Heroes later on, so that once they reach Hero Lvl 9 with maxed XP bar, you'll be able to advance them to Lvl 10 right away. - Note: Iso-8 Crystals only starts to drop once you reach Commander Lvl 5. - If you are wondering which Iso-8 Crystals you should be aiming for early game, I would recommend getting Iso-8 Sets that only require 2 pieces to activate. - Chapter 1 is also a nice source of Iso-8 Crystals for beginners, because the drop chance of Rejuvenating Iso-8 is pretty good. Follow the color of the slots to get +50% bonus stats. - If you are looking for another good starter Iso-8 set, here's another one. Common, easy to get, and works great especially with Tanks + Healing or Regen. What Will Happen If I Replace or Remove an Iso-8 Crystal? - After paying the fee with Silver, the replaced or removed Iso-8 Crystal will go back to your Inventory, so don't hold back and equip them to your Heroes. Experiment and have fun! Should I Prioritize Stats over Sets? - Yes, better aim for higher tier Iso-8 Crystals with more Stars and key Stats for your Hero, then make them a Set later as a bonus. - Once you unlock this feature, go and farm higher tier Iso-8 Crystals that you can. - Now, just continue with game and enjoy! Explore and follow your play-style for higher levels. - Game Crashing: If your game sometimes crash for some unknown reason when starting a fight or mission, I highly recommend that you fully exit M:AA2 first to refresh the game before launching a new Scouting Mission. Why? because you can only get around 2 runs per day, and wasting 1 or more of them due to a game crash is a very big waste. - Some players say that if you received a Hero Ability from a Superior Power Cell, do not open another one right away, because there's a chance that you'll get that exact same Ability again. Wait for a couple of hours before opening one. - Some players also say that if you received a Hero from a Superior Power Cell (not Gold), open another one right away using Gold to get another Hero. The chances are good according to them, and if I remember correctly, I got two 3-Star Heroes by doing this before, might be true or a bug, not sure.